This has been a busy week for all the people who inspire me most. One of those is Iris Apfel, a 91 year old goddess who is so incredibly wild. She is the queen of over-accessorising, and puts so much effort into her outfits but has so much fun with it. It has just been announced that she is launching a handbag range called 'Extinctions.' Information is scare but I can't imagine the collection will be anything but wild. The prices will range from £150-£250. Iris is a busy bee, and as well as this new handbag collection she is launching an eyewear collection called 'Eyebobs' which is launching next year, ranging from £40-£60. Can't wait to own a pair of Eyebobs. “I think it’s fun to dress up. It’s an exercise in creativity. And it makes you feel better. 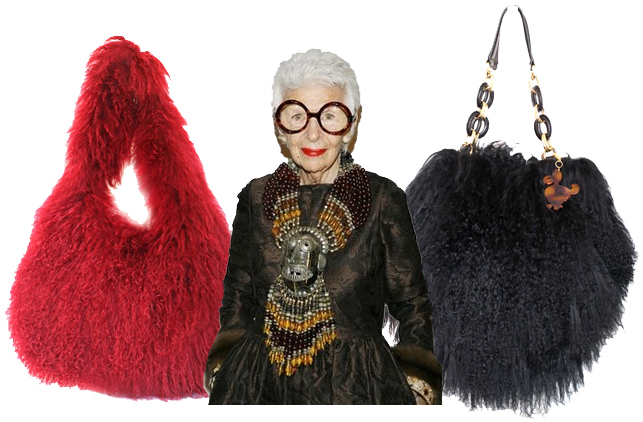 Sometimes you’re in a funk and you put something on and twirl yourself around and–bam.” Iris Apfel. Couldn't have said it better myself, Iris. Images courtesy of Fashion Foie Gras & google search. Oh gawd I just love her. I mean, who couldn't really. Bring on the Eyebobs.